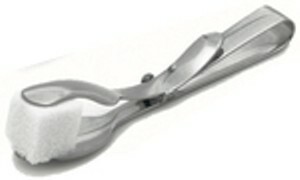 These Mini Clip Bar Tongs offer a unique contemporary design in sleek looking, polished stainless steel. They are convenient for grasping the olives and cherries on your wet bar. They are also perfect for serving trays at parties or on buffet tables at picnics. Perfect for small fruits and veggies!